There is a diverse range of rock art present in the Kimberley. This large variety of styles and sites reflects the cultural and artistic development in the region and can be understood to move through distinct Epochs as described in Grahame Walsh’s Rock Art Sequence (published 1994) and the more recent Rock Art styles. George Grey stumbled upon Wanjina paintings that he drew and recorded in his journal. An account of his travels, Journal of Two Expeditions of Discovery in North West and Western Australia, was published in 1841. Joseph Bradshaw, an English pastoralist who travelled in the Kimberley in the 1890s, is thought to be the first European to have documented the elongated, dynamic figures that initially came to bear his name. Bradshaw recorded and sketched these paintings and was fascinated by their aesthetic sophistication. Dr. Helmut Petri was the leader of a German expedition to the Kimberley organised by the Frobenius Institute of Frankfurt. Other members of the research expedition were Dr Andreas Lommel, Agnes Schulz, Gerta Kleist, American journalist Douglas C Fox and Australians Patrick Pentony and Arthur Capell. Petri returned to the Kimberley in 1954/55 and then visited regularly from 1960 through to the 1980s. The late Dr. Grahame L. Walsh and others appreciated the importance of publishing the findings of the Frobenius Institute’s expeditions in English. Die Unambal by Andreas Lommel and The Dying World in Northwest Australia by Helmut Petri were translated into English by Dr Ian Campbell of Armidale NSW. 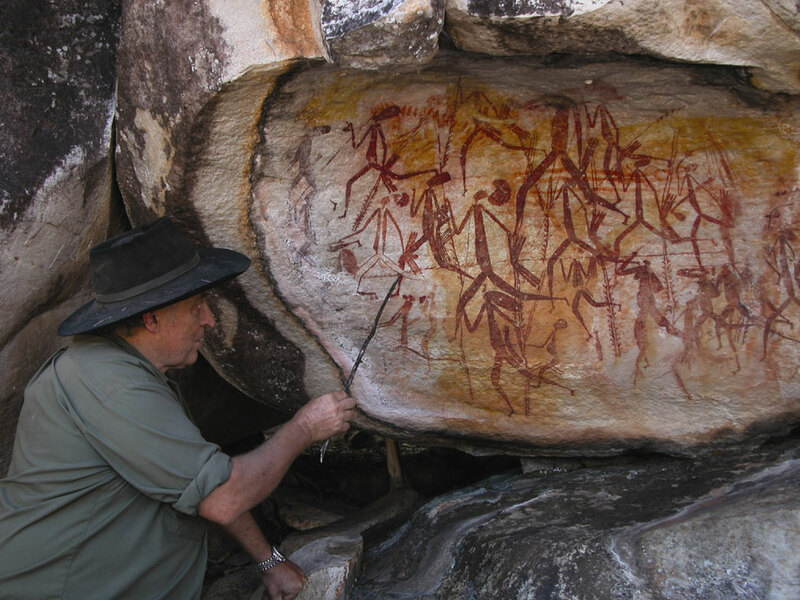 Amateur archaeologist and rock art expert Grahame Walsh proposed three distinct epochs of rock art with a number of different forms in each, of which the Gwion and the Wanjina forms are the most well known. Walsh was renowned for his seminal works on rock art, including a prized volume titled Bradshaws: Ancient Rock Art Paintings of North West Australia, 2000. Many respected scientists have since contributed to the body of scientific and cultural research on the Kimberley. The significance of the changes in art styles and the time frame in which they occurred warrant scientific investigation using a broad range of scientific approaches. The Kimberley Foundation Australia’s research program (link to Research) began with the support of The Ian Potter Foundation (link to Ian Potter Foundation website link). Their contribution has enabled KFA to significantly strengthen its research commitments and capability. I have been fortunate to see some of the breathtaking rock art of the northwest Kimberley region and fully support the research work undertaken by the Kimberley Foundation. Their research will help us all better understand and protect this rich cultural heritage.